I am back In the kitchen today and I am working on OAT recipes. Yes, oats are probably one of the most Important things I have in my kitchen. “WHY?”, You ask. Well, oats can be used for so much, breakfast, lunch and dinner. I use them for meat substitutes, for making snacks, for making drinks and so much more. Today, I wanted to share with you two different ways, polar opposites, that I used oatmeal. My first is making Oatballs, in place of meatballs. Now, I know that sounds funny, but they are great for meat subs. In a frying pan sauté your chopped veggies until they are soft and onions are translucent. In a large bowl, have your oats ready. Place sautéed veggies in bowl with dry oats. Add your brags, your oil and your seasonings and binder (egg or flax gel) begin to work together with a large spoon. You will begin to see clumps form. Use your hands and begin to work the oats well, until you can see everything well mixed. Then you should oil your hand (I use the canola oil) so that as you begin to form your balls, the mixture won’t stick as much. Don’t make them too big, or you will end up with a uncooked center. Place the balls in a oiled non-stick pan and let them fry on all sides. Watch them closely as it doesn’t take the oat balls long to brown. 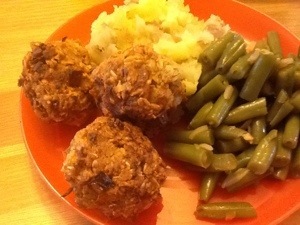 Once all sides are browned and well cooked, place the balls to the side in a dish to cool OR you can prepare a gravy (see cashew gravy recipe) and eat with a side of veggies, mashed potatoes and a salad. My kids love them and so do I! You can add to the recipe in any way you like. You will begin to discover ways to season your oats and love it all the more. It’s never too late to sew your wild oats….lol.